T-Mobile (soon to be AT&T) and LG have a great relationship. Together, the companies are working together on the G-Slate tablet and a new premium Android phone, the T-Mobile G2x. I got my hands on the G2x yesterday afternoon and it has some impressive features. Most notably, the ability to instantly stream HDMI content (via its Mini HDMI port). This feature is called HDMI Mirroring. When connected to a big screen, I was able to actually use the phone as a controller and play Android games on a 40-inch TV screen. This feature isn’t brand new, but out of the box, it’s an interesting addition. The G2x doesn’t skimp much on specs either. It runs Android 2.2 (2.3 coming, they tell me), can run on T-Mobile’s HSPA+ high speed network, has a 1GHz Tegra 2 dual-core processor, 4.0-inch display (480×800), 512MB of RAM, and 8GB of internal storage. The rear camera pumps out 8MP images with a built-in flash and can record 1080p video at 24fps–the front camera is 1.3MP. LG’s Optimus UI add-on to Android is pretty minimal and mostly lets Google’s OS do its thing, which I like, and the overall experience was very snappy, if a bit standard for an Android device. 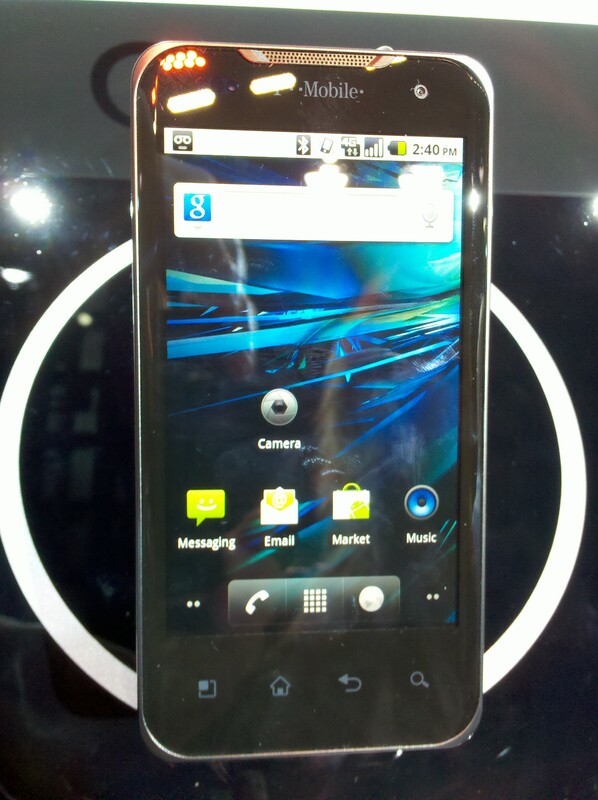 For the most part, this is a good looking, solid new Android phone with a responsive and bright screen. We look forward to checking it out at launch, but it appears to be a great addition to T-Mobile’s burgeoning Android lineup. I’ve included a short video below from the show floor below that runs through some of the features. Please forgive the lack of focus.